Leopards (Panthera pardus) are masters of camouflage, shy, elusive and hard to spot. Not for our camera traps which took a total of 7 captures of leopards across our survey period. This photograph was taken in the cool dark of night, just before midnight - perfect time for hunting. An exciting project after establishing our conservancy, "Ukuwela", was to conduct our first biodiversity survey. By using motion-triggered camera traps, we were able to peer deep into the wild spaces of Ukuwela, and with the help of technology, to "see" the many diverse species that already call it home. Ukuwela is located in one of the world's most biologically rich and endangered land-based eco-regions, in KwaZulu-Natal South Africa. It's surrounded by several large private and government wildlife reserves. This means that small-to medium sized species of wildlife can easily move in and out through fences and natural barriers such as the river. Our wildlife ecologists and neighbours had already spotted honey badgers, hippos and crocodiles on Ukuwela in addition to impala, zebra, nyala antelope and wildebeest that had been introduced by the prior owner. In order to find out what other wild and more elusive species are already present at Ukuwela, a camera trap survey was conducted by our wildlife ecologist Axel Hunnicutt, with the help of a team of Wild Volunteers keen to roll up their sleeves and help out on a real conservation project. It was the first time we'd seen a hippopotamus (Hippopotamus amphibius) on the move and out of the river at Ukuwela, captured here feeding on grass in the cool of the night. These shots was captured at 3am using a motion-triggered flash. Ten camera trap stations in total were placed evenly across the wider conservation area, covering a total of 620 acres (1,532 acres) and several habitat types including along the river, bushclump thickets, mixed acacia woodlands and recovering savanna. Across a period of 45 days, the cameras took over 370 shots at both day and night, with the movement of wildlife walking past the camera triggering the capture of a candid photograph. A total of nineteen different species of medium-to-large sized mammals were captured by the survey, in various frequencies. The species most photographed were nyala, appearing in 104 photos, followed in order of occurence by impala, large spotted genet, vervet monkeys, red duiker, plains zebra, common duiker, cape porcupine, scrub hare, blue wildebeest, leopard, hippopotamus, banded mongoose, bushpigs, white tailed mongoose, warthog and a single camera trap photo each of a honey badger, common reedbuck, and an aardvark! A Common Reedbuck (Redunca arundinum) approaching the camera, late afternoon. A pair of Vervet Monkeys (Chlorocebus pygerythrus) play in front of the camera. The largest rodent in southern Africa, the Cape Porpcupine (Hystrix africaeaustralis). 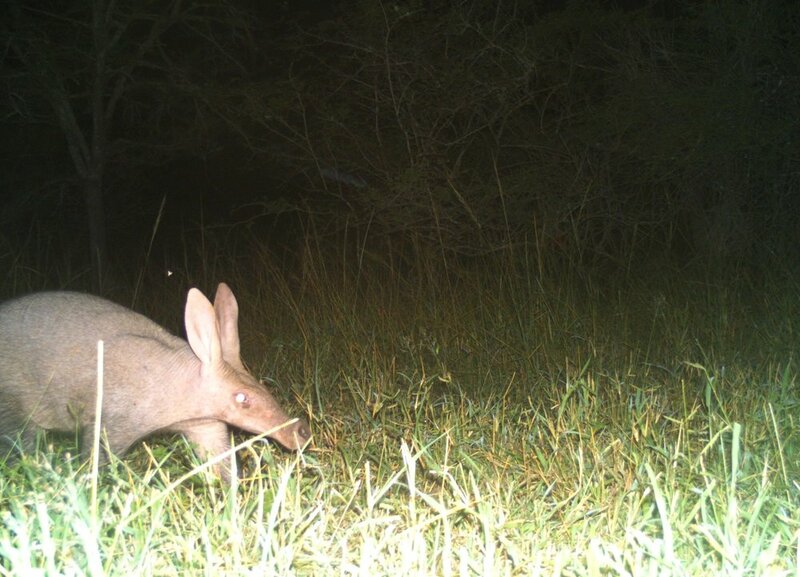 The species that the Wild Tomorrow team was surprised to see caught on camera was the aardvark, captured in a single image. Aardvark are not currently threatened (classified as Least Concern by the IUCN Red List) but their habitat has been destroyed by agriculture in many areas and they are often hunted by farmers who find their hole-digging to be a nuisance. However, they are an important part of healthy ecosystems as the burrows they create, although annoying to farmers, provide important shelter for many species, including warthogs, porcupines, jackals and black-footed cats. This makes the aardvark an important keystone species, benefiting the survival and abundance of many other species, and an exciting find on Ukuwela. An Aardvark (Orycteropus afer) appeared once in the camera trap survey. Rarely seen during the day, it was photographed at 1am in the morning foraging for food. The high abundance of leopards roaming across Ukuwela was another important insight revealed by the camera trap survey. Due to the threat of poaching for bushmeat, demand for their skins, and conflict with livestock, leopards face severe threats outside of protected areas and are categorized as "Vulnerable". Population studies in South Africa, including locally in KwaZulu-Natal, have found severe declines in recent years. Neighbouring leopards at Hluhluwe-iMfolozi reserve declined by 22% in the past 7 years; and by 13% at uMkhuze. Both of these state-run wildlife reserves are in the immediate range of the leopards spotted at Ukuwela. With no other large predators currently roaming on Ukuwela, perhaps leopards are carving out a less competitive niche in this small slice of habitat outside of protected areas. It is an interesting observation that Axel is hoping to research in more detail. "The number of different leopards found using Ukuwela was surprising given the relatively small size of the property. Seeing so many large carnivores and smaller carnivores, in addition to such a variety of other animal species, is evidence that Ukuwela has quickly recovered to an intact ecological system, one that we need to continue to protect" said Axel, reflecting on the survey results. A leopard (Panthera padres) at sunset on Ukuwela. The South African Large Spotted Genet (Genetta tigrina) was captured on camera 32 times during the survey. A spotted hyena (Crocuta crocuta), eyes bright in the camera flash, looks right at the camera, perhaps hearing the click of the shutter. This photograph was captured prior to the survey. A Plains Zebra (Equus quagga) in the late afternoon. Camera-trapping has yielded important insights into the current diversity and abundance of mammals at Ukuwela. Globally, it has exploded into the conservation scene as a new key tool in wildlife research, leading to major discoveries in other corners of the world. In China, the Amur leopard was documented for the first time in 62 years thanks to camera trap surveys. In New Guinea, the highland wild dog, feared to be extinct, was found in a remote mountain area thanks to camera trap research. And in Tanzania, photographs confirmed the discovery of the gray-faced sengi of Tanzania, an elephant shrew. Particularly important in the case of critically endangered and species feared extinct, camera traps enable scientists to conduct research by collecting photographic evidence with minimal disturbance. Camera trap photos have also been important in raising conservation awareness with global audiences. The elusive lives of wildlife captured by camera traps can create powerful visual stories that generate excitement across social media channels, creating increased awareness and support for conservation challenges. We are excited to continue sharing the results and excitement of our ongoing camera trap survey which will continue to collect data for analysis and an updated baseline every six months. This will inform our plans to re-wild our new conservancy Ukuwela and enable us to measure our progress in restoring Ukulele's incredible natural ecology. Thank you to Biologists without Borders and all of our individual donors who have contributed to help us purchase camera trap equipment for our scientific field research projects. If you'd like to help purchase more cameras, please click here. A huge thank you to Anton Roberts, Harriot Brill and their team of Wild Volunteers who dedicated countless hours in the field, deploying camera traps, collecting and uploading data, and classifying images for this ongoing project.